PARIS — HE sat in the car, frozen with fear, as gunmen pointed rifles at his pregnant mother in the driver’s seat beside him. They were rushing to the king’s birthday party because they had heard there was a commotion. It was the summer of 1971, and the Moroccan Army killed over 100 party guests in its attempt to overthrow the monarchy. The gunmen spared the pregnant woman and her 7-year-old son. Later that day, the coup failed. With his monarchy preserved, King Hassan II sharply tightened his grip on his subjects, including his own family. It was a shift that the 7-year-old, Prince Moulay Hicham El Alaoui, still remembers well. The eldest son of the late King Hassan’s only brother, Moulay Abdellah, he is also the first cousin of King Mohammed VI — making him third in line to the Moroccan throne. Nicknamed “the Red Prince,” he grew up to become a political activist whose public support for democracy has put him at odds with his family in Morocco. He exiled himself to America and was banned from the presence of the king for advocating a constitutional monarchy, like that in Britain or Spain. In a culture where princes are expected to hold their tongues and where family affairs do not leave the palace walls, Prince Moulay Hicham isn’t welcome. 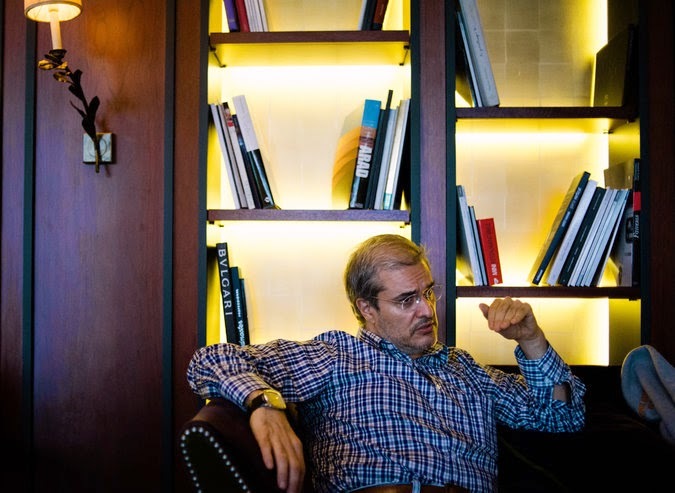 In April, he published a new autobiography, “Journal d’un Prince Banni,” or Diary of a Banished Prince, that weaves together a series of vignettes and anecdotes to give readers a rare glimpse into Morocco’s royal family. But it also serves as a harsh political critique of the kingdom from an insider. The book, which will be translated into English in a few months, details how King Hassan, who died in 1999, constructed an opaque system of rule in which the elite could flout the law with impunity. Though he celebrates the late king’s undeniable grandeur, the prince describes him as an evil genius who brought Morocco onto the world stage. He also gives an intimate view of life inside the palace, growing up among the intrigues, and the mind games between him and his uncle. He employs a sharp wit to describe some of his uncle’s more perplexing episodes, like the day in 1980 when Hassan made Queen Elizabeth of England wait an hour for him — meant to show, it was believed, that he was the greater monarch of the two. Prince Moulay Hicham also talks about the humiliation to which he was subjected, and shares intimate accounts of his father’s alcoholism and his mother’s battle with substance abuse. WHEN Mohammed VI inherited the throne in 1999, he was welcomed by a burst of optimism that withered after a few ineffectual gestures toward greater democracy and human rights. In 2011, as the Arab Spring was sweeping autocrats in Tunisia, Egypt and Libya from power, King Mohammed offered constitutional reforms that guaranteed more social equality and attention to human rights. But Prince Moulay Hicham says those changes were once again cosmetic, and he has repeatedly urged the kingdom to make swift changes. Real democratization, he argues, is the only change that will save the monarchy in the long run. King Mohammed has come under fire for his stranglehold on the economy and for micromanaging the elected government. John Waterbury, an American scholar and author of “Commander of the Faithful,” an extensive account of Morocco’s politics, said Prince Moulay Hicham’s book provides intimate details that shed light on the monarchy and the king’s entourage. That attempt at transparency, Mr. Waterbury said, was bound to spark shock and anger. THE prince, who holds degrees from Princeton and Stanford, and is a former United Nations peacekeeper in Kosovo, serves on the advisory board of Human Rights Watch and has founded various institutes. A businessman and passionate advocate of green energy, he also produced the award-winning documentary “A Whisper to a Roar,” on the fight for democracy across the world. Politics — in particular the direction of his country — remain at the heart of his activism. “Moroccans are as well in a comfort zone. They want change, but they don’t want to go through what Tunisia or Egypt went through,” he said. The prince has been estranged from the current king for 20 years, save for a few rare meetings. His daughters, on the other hand, are close to Mohammed VI. He said that while he doesn’t really know his cousin anymore, he has fond memories of a happy childhood together. As for the reaction to his book in the Moroccan media, he just shrugs.